Will VR change the way we love? At Slush 2016 (Helsinki’s annual startup and tech event), Nokia showcased a music video filmed using their OZO VR camera. Although I had tried VR games and thought they were fun, this video took me to a very different emotional place. As I stood (virtually) between a young couple finding each other and falling in love, I found myself misty-eyed. If you have a VR headset, you can watch the video featuring the music of OneRepublic here. That experience left a lasting impression on me. Something changed inside me when I was able to stand close to this couple. It was after this immersive, emotional experience that I began to wonder – will VR change the way we love? Biological Anthropologist Helen Fisher assures us that technology is not changing the type of person you’ll love or how you’ll feel love. But Fisher does note that technology is making an impact on how we court, or how we meet and pursue others romantically. Take matchmaking sites, for example. Fisher – who is also match.com’s science advisor – explains that these sites give people so many choices that they experience cognitive overload. And when that happens, they just can’t decide who is “Mr. or Mrs. Right” – at least not after a long processes of considering their options. Coupled with fears of divorce, what we’re seeing today is a new form of courtship Fisher calls “slow love.” The pre-commitment stage before marriage is now much longer than ever before, and technology in the form of websites, chats, social media, and dating apps has played at least some part in supporting this new model of courtship. So what happens if we carry Fisher’s discussion about love and technology over into VR space? VR technology will probably make it easier to find people to love. It may even have the potential for weeding people out before you even make it to the “slow love” stage. From this scan, the next leap of logic is easy. Dating sites of the not-so-distant future will allow you to upload these 3D-scans and animate them so you can “pre-meet” people in a virtual environment. 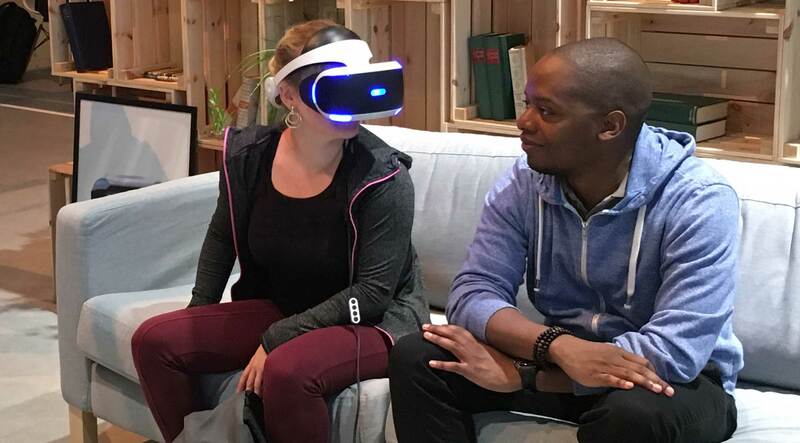 Instead of exchanging messages and reading profile after profile, you could just specify to meet people with certain interests in a VR cafe – all while your physical body stays at home in your pajamas. Using your virtual avatar, you could meet others and talk over a steaming cup of virtual joe. And if things work out, you could move on to meeting each other physically in real life. If not, well, your VR experience saved you the hassle of getting dressed up for a fancy dinner.